I was meant to do a post on Ramadan BEFORE IT STARTED but then it started and i was lazy and SURPRISINGLY THE TIME GOES BY QUICKLY…and now it’s already the 11h fast! anyways so i’m in London atm and the fasts are about 18hrs long…BUT if you live in an area where there is no discernible night then you should fast for 12 hours coz it doesn’t make sense to fast for 22hrs…like God doesn’t want to make it HARD for you. but unfortunately there is a lot of division WITHIN the Ummah even though Ummah is meant to mean brotherhood and we are all Muslims following One God etc but culture gets in the way as well as sectarian differences. The Quran (Holy Book) was revealed during the month of Ramadan. What exactly do Muslims do in Ramadan? Fasting means abstaining from food, drink and sexual relations. No you can’t drink water. The most important thing is your intention to fast for the sake of Allah…you are doing it for no one else but God. I mean sometimes you’re cooking and you accidentally eat something then you realise you’re fasting that’s okay but if you obviously sneak some food while you’re fasting thinking no one can see…well you’re not fasting for other people, you’re fasting for God and He can see! Muslims fast from dawn to dusk (so we get up before sunrise, eat and then pray Fajr and sleep) and then we only break our fast at sunset. We also increase our remembrance of god by making zhikr (like when you use a rosary?) and we try and complete a whole Quran (as in reading/reciting the whole Quran). Not only that but Taraweeh is a voluntary prayer after Eisha salah in Ramadan. It’s usually long and the goal is to complete the whole Quran in a month. It is not obligatory but it is just extra prayer. Prayer is not FOR God but for US. We need it. Certain people are exempt from fasting like if you’re pregnant you don’t have to fast or if you’re travelling, on your period, or really sick BUT you have to make it up after Ramadan. If you are able and if you can’t fast for some reason you have to pay a certain amount of charity. God doesn’t want to make life hard for us but make everything easy and everything in moderation. Usually kids start fasting from a young age and keep half fasts and as they get older they want to fast like everyone else and you get lots of presents or money for Eid if you keep all your fasts (more of an incentive than the spiritual reward) but when you’re older you begin to understand the beauty of Ramadan and how it really is a blessed month. so when you hit puberty that’s when you have to fast. i think i started fasting at around 5 or 6…half fasts and then full ones. i’ve always loved Ramadan because of the atmosphere and excitement and you get extra special nice food for Iftar! At the end of Ramadan is Eid-ul-Fitr which is basically a celebration after Ramadan. There are special Eid prayers, you wear your best clothes and you eat lots of food and spend time with family and give lots of charity and it’s a time to celebrate and thank Allah for all that he has blessed you with. People exchange gifts and it’s generally a really happy lovely time. Of course it is also important to remember those who don’t have everything we have and be grateful for what we have. Growing up I always loved Ramadan. It’s always been an exciting month, preparing for the month and just the whole excitement of fasting and yeah I love food but the whole point of Ramadan is sacrifice and reflection. I actually like fasting, like it’s not so hard, I mean yeah sometimes you feel really hungry but then you just go pray and you think about why you’re doing it and then it’s okay. i usually get thirsty but it’s not so bad. Plus I am blessed enough to know that I will have food to eat when I break my fast unlike many people in the world who don’t have food. There are Muslims around the world who don’t have food yes still fast and that is so beautiful that through every difficulty their iman (faith) is still strong. And hopefully we shall be rewarded for our efforts whether it’s in this world or the akhirah (afterlife). I’m on holiday atm so fasting isn’t that bad because i try and keep myself busy so the time goes by (since it’s a pretty long fast). I feel sorry for those who have to go to school and work because it’s hot and trying to concentrate while fasting can be hard especially if you’re thirsty. I miss spending Ramadan in South Africa with my cousins (it’s also a short fast there as it is winter) but Alhamdulilah it’s nice to be fasting in our new house. Suhoor is when you get up to eat in the early morning- i usually eat eggs or toast or have a smoothie and drink lots of water! Iftar is when you break your fast and the last few hours of fasting is always the worst because you can smell the delicious food and you know it’s almost over but it is also a really blessed time so you should maximise your prayer and I keep distracted by reading Quran and the time goes by. 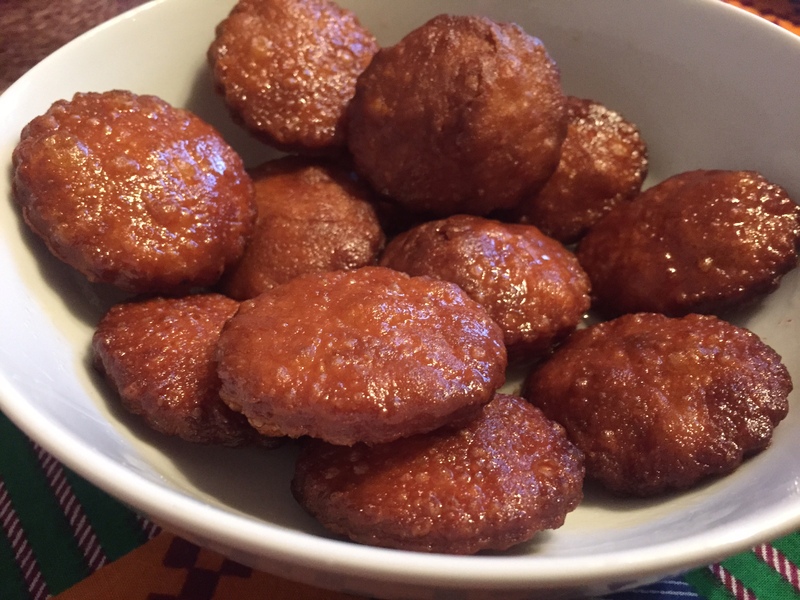 here’s a pic of the dhaiwaras which is basically fried dough dipped in syrup but it is delicious. We usually have it every Ramadan. One of my favourite things about Ramadan is that it is a collective thing; the whole Ummah is united in that we’re all fasting for God. Ramadan is my favourite time of the year because not only is Shaytan (Satan) locked away, but it’s the time to focus on worshipping Allah and you don’t have to deal with worldly distractions. I went to the Ramadan Tent yesterday. it’s a project started by SOAS students (woop woop represent). So it’s a tent and they have rows on the grass set with dates and water and some sweet things and then there is a short talk on things to do with Ramadan. then we wait for the adhan (call to prayer) and finally we can break our fast. then we go and pray in jamaat (everyone praying together) and then we come back to the tent and finally food is handed out (in foil containers) and you can share with people or have your own and just eat and talk and yesterday there was a baking stall for charity so i bought some pretzels. It’s a nice experience as anyone can come not just Muslims. anyways if you are a Muslim and fasting make the most of Ramadan and remember to pray for the world…for the people in Palestine, Syria, Iraq, Somalia, Burma, Pakistan all over the world…pray for those who are oppressed…those who are sick…and pray for the Ummah. oh and just FYI…you can break your fast if you are dying or in pain or something…like God is ALL forgiving and merciful. Remember me in your duas!